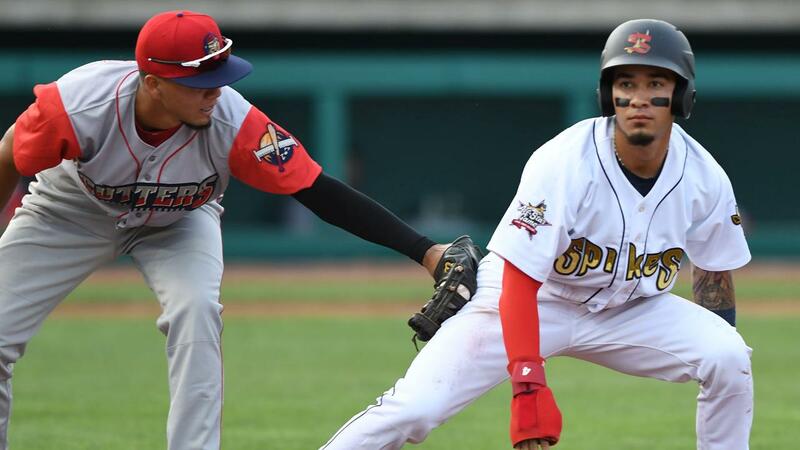 WILLIAMSPORT, Pa. - The State College Spikes began their final series of the 2018 season with a 7-3 loss to the Williamsport Crosscutters on Saturday night at BB&T Ballpark at Historic Bowman Field. Stanley Espinal , who was named the Spikes (34-40) Most Valuable Player prior to Friday's home finale, led the way with a 2-for-3 night for State College that included a double. Two big innings downed the Spikes, though. In the first, Jake Holmes blooped a single to right-center field to score the first Williamsport (32-42) run, followed by Edwin Rodriguez 's three-run homer to right, his third of the year, to extend the margin to 4-0. In the sixth, Holmes lined a single to right for one run, and Rodriguez doubled in two more runs to complete a five-RBI night. The Spikes scored their first run in the fifth when Wadye Ynfante doubled and then crossed the plate on a Williamsport error. State College also tried to make a late comeback attempt, but after Delvin Perez tripled in one run and Edwin Figuera singled in another in the ninth, Jose Jimenez struck out Jonatan Machado to end the game. Figuera tied a Spikes franchise record during the game by getting hit by a pitch for the 20th time this season, matching the mark Tyler Gaffney set over just 38 games in 2012. Franyel Casadilla (4-3) started and took the loss for State College. Casadilla was charged with seven runs on seven hits and two walks over 5 1/3 innings. The right-hander, who was named the Spikes Pitcher of the Year prior to Friday's home finale, struck out two in the effort. Reliever Cory Malcom ended the night on a high note for State College, striking out seven batters and giving up just one hit over 2 2/3 innings on the mound. Williamsport starter Ethan Lindow (3-2) earned the win after yielding one unearned run on three hits over six innings of work. Lindow also recorded five strikeouts. 2018 first-round draft choice Alec Bohm also produced two doubles for the Crosscutters. Sunday, the Spikes and Crosscutters meet for the middle game of their three-game, season-ending series at BB&T Ballpark at Historic Bowman Field. State College will send left-hander Eli Kraus (2-2) to the mound to match up with Williamsport right-hander Francisco Morales (4-4). Catch all of the action on Sunday via the Spikes Radio Network, presented by Penn State Sports Medicine, Official Healthcare Provider of Penn State Athletics, at 4:50 p.m. with Spikes Live, presented by Mount Nittany Health, on the air from BB&T Ballpark at Historic Bowman Field. The Spikes' radio broadcast can also be heard worldwide through the "Listen Live" link on StateCollegeSpikes.com, provided by the club's flagship radio home, NEWSRADIO 1390 WRSC, as well as the TuneIn Radio app. Fans can inquire about 2019 Season Ticket memberships and a variety of group packages and experiences for the 2019 season by calling the Spikes at (814) 272-1711. Additional team and ticket information can also be viewed at StateCollegeSpikes.com.